Is There Still A Hanging Produce Scale For Sale That’s Certified Legal For Trade? We usually focus on the digital retail scales that you see at the market each week but today we wanted to look at a classic scale you’ve probably seen at a produce market. You would be surprised at how often customers ask if they can still purchase a hanging scale for weighing their produce at the farmers market. 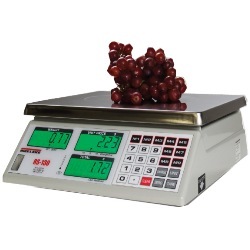 Even though we now have the super fast and relatively reliable digital scales available, many customers actually ask for the proven performer with the dial that spins around to display the weight. Sometimes it actually does make a lot of sense to choose one of these classics. If you don’t want to fool around with batteries every few weeks, then a hanging dial scale might be a good choice. If your location has an overhang or tent that is easy to attach a scale to, then this might be a good idea for you. Of course, if you choose to go this route, you will want to choose a NTEP certified legal for trade hanging scale like the Chatillon series. It’s also a good idea to get a scale that has the double dial so both sides can see the dial and completely agree on the weight that is listed on the scale dial. Unfortunately, if you do choose one of these scales, you will need to bring your calculator with you to calculate the price per pound. The Chatillon Century Series hanging scale is well known for accuracy, dependability and reliability. The Century Series feature a glass-covered 7-inch dial that reads clockwise. A double dial option is available (one dial reads clockwise, the other counter clockwise). These scales feature a corrosion-resistant band, bezel and housing and have a rugged, steel inner frame. Scale capacities are reached in two pointer revolutions. The Centry Series are Class lll “Legal for Trade” scales. Century Series can be supplied with a CG Series scoop or the popular CAS circular pan. The CAS Pan is constructed of stainless steel. 3-inch deep round pan has drain holes. The CG Scoop is ideal for weighing loose materials. Scoop and suspension chain of galvanized construction. We all know that the best quality strawberries are the ones you pick yourself out of the field or buy from a local strawberry farmer at the market. These strawberries are almost always the freshest you can obtain. Their taste and red color are exceptional. Nothing really compares to the flavor and aroma of fresh picked strawberries. Below are a few pointers if you are planning on picking some berries. Of course we always recommend a scale that weighs strawberries. We were doing an internal poll around here thinking about what fresh foods we were looking forward to buying once the farmers market opens up soon. Below is an overview of a few of the top picks among our group of hungry eaters. Strawberries, blueberries, okra, corn, jalapeno peppers, bell peppers, red onions, cantaloupe, kale, beans, cabbage, cucumbers, collards, bananas, spinach, peaches, pecans, butternut squash, tomatoes including cherry, grape, roma, and slicing, turnips, and watermelon. We all need fresh produce. It tastes good and it is good for you. However with all the pesticides and other particles that are located on the outside of the fruits and vegetables, the benefits can be reduced or can even cause you more harm than good. But there is an easy way to clean your produce. Most people think running fruit under water for a few seconds gets the job done. Not quite. Designed from the ground up as a portable retail scale with a small footprint and battery power, the RA combines a bright, backlit LCD display on front and back of the housing with a 7.9 X 11.4 inch stainless steel pan. The RA can be powered by 6 “D” cell batteries for up to 60 hours continuous use, or using the included AC powerpack. To conserve power the RA has a battery-saving low-power sleep feature. NTEP 3,000d certified, the RA offers 2 models in either 15 or 30 lb capacities. Great for use in farmer’s markets, delis, bakeries and other retail locations where space is a premium. For use with larger packages or for use in delis, grocery and convenience stores, the OHAUS RE price computing scale features a large 9.5 x 13.5 inch weighing pan made from thick stainless steel to stand-up to years of use. Available in both a regular form factor as well as with a 16.7 inch tall column for the display, the RE line quickly displays weights on its large backlit LED display. All RE models can be powered by 6 “D” cell batteries for up to 60 hours continuous use with a easily visible battery status indicator, or using the included AC powerpack. To conserve power the RA has a battery-saving low-power sleep feature. The RE is available in two 30 lb models – one with the column – as well as a 60 lb model without column. The Prepack Pricing mode is a key feature for stores who price-out larger runs of items, especially for smaller stores and delis.